This media contains digital photos and a button "Open F-spot Photo Manager"
When you click on this button it opens F-spot manager. "Error Connecting to the Camera"
"Received could not lock the device while connecting to the camera"
The problem is that soon as you open camera (as mention earlier) it gets mounted and for some reason it looks other applications including fspot from gthumb from accessing it. But if you right click on the camera in nautilus and "unmount" it fspot & gthumb can access the camera fine. So soon as one clicks the "Open F-spot manager" it needs to unmount the camera either that or remove that button completely. I am not sure how you have assign it to Fspot when the same problem occurs for GThumb. The problem is actually with GVFS mounting the camera, which blocks photo management applications from then accessing the device. This will be fixed for Hardy by simply not including the GVFS Gphoto2 backend. Note that my #209962 bug has been marked a duplicate, while it's a different issue : the command-line to launch f-spot itself fails in the Nautilus application, while this bug relates to a failure in the import of f-spot itself. The gvfs mounting appears to be gone now. Well this is fine, but I can't find a logical way to delete pictures on my PTP camera in fspot. The gvfs method was the only way I knew. how did you do before this cycle? The problem seems to be fixed now. The camera doesn't get mounted in the Computer section. Even when "ignore" is selected when Gthumb asks if you want to import the photos. When you open Fspot and choose import photos, it is able to access the camera. > how did you do before this cycle? I just discussed this with Sebastien. nautilus relies on the gvfs gphoto backend for camera detection, but that does not work properly yet and we disabled it. Thus we'll switch back to using g-v-m for photo cameras, which fits better into the current g-v-m dialog anyway. We'll disable the photo app selection widget in nautilus. There's still something weird going on that is related to this. If I insert media containing photos I expect the command specified by the gconf key /desktop/gnome/volume_manager/autophoto_command to be run. However, this isn't happening. Instead, nautilus is trying to launch its idea of what should be handling photos and it is broken. It seems to be launching f-spot via /usr/share/applications/f-spot.desktop. I'm not sure where this association with nautilus is made - too many moving parts to understand. However, f-spot can no longer be run in import mode without specifying the --import option and f-spot.desktop is not specifying that option. I just get a dumb usage message in ~/.xsession-errors. So, shouldn't autophoto_command be used for media containing photos? If not, the association with nautilus needs to be fixed so that f-spot-import is run rather than f-spot. * There doesn't seem to be a relevant g-conf key. Martin, indeed nautilus in hardy should drop the camera program chooser, since nautilus' handling of cameras is known broken. then plug in your camera. Press Control-C, run "/usr/lib/gnome-volume-manager/gnome-volume-manager", and attach /tmp/gvm.log here. Thank you! So, do the above but insert my SD card instead of plugging in a camera? > card from a camera into a reader. cannot handle this any more. This bug appears not only affect in the case you insert a SD or CF card. It also applies to all cameras which behave as storage device (not PTP). Attaching such cameras (in my case: Casio Exilim Z600) gets you into the same troubles as described above (new volume icon --> Nautilus with broken button 'Open F-spot Photo Manager'). My guess is that this bug affects quite a number of Ubuntu users. Yep, I agree with the last 2 comments. * If the 1st arg is --import, then don't touch anything - assume sanity. * Otherwise, for each file:// arg, add a --view arg before it. A patch that does all of the above is attached. I've patched /usr/bin/f-spot rather than the source file... however, if the patch is useful then it should be easy to apply to the source file. Some of the code is bash-specific - without bash I think all is lost, since bash arrays provide a way of maintaining filenames with whitespace in them. The above patch is now even more dodgy, since https://bugs.launchpad.net/ubuntu/+source/f-spot/+bug/202717 is fixed upstream, so multiple files/uris to --view are supported again. I've attached a rediffed patch to that bug. I guess that nautilus just needs to be told to use "f-spot --import" when trying to import. I still don't know what tells nautilus how to call f-spot. If someone can tell me where that happens then I'll create a patch. * Inserting a media card from a camera still results in failure in the form of a usage message from f-spot. from the command-line results in f-spot opening and displaying a pop-up saying it couldn't find a camera attached. I did a bit of digging, and wrote a systemtap script to work out what was happening ... and I think I know what's going on. Nautilus is launching f-spot, this is configured in from System->Preferences->File Management, then the "Media" tab. There is a drop-down next to "Photos", which lets you choose what to do when photos are found. On my system there are five options, ask, do nothing, open folder and "Open F-Spot Photo Manager" and "Open F-Spot Photo Manager". The trick is that you need to use the second option - it corresponds to /usr/share/applications/f-spot-import.desktop, which passes the --import option. So problem number one is that /usr/share/applications/f-spot-import.desktop and /usr/share/applications/f-spot.desktop, both have the name "F-Spot Photo Manager" - so there's no way to determine which is which in the Nautilus configuration. That is an f-spot bug. It's fairly easy to fix just by changing the name to "F-Spot Import" or something. Which does open f-spot, and even opens the import window, but no directory is selected. I have to manually select my disk from the drop-down menu. Using f-spot --import /media/disk works fine. That also seems to be a bug in f-spot. As a workaround, changing the "%u" in f-spot-import.desktop to a "%f" fixes the import not showing anything, at least for importing from a mounted memory card - probably breaks other uses, but that'll do for me. > cannot handle this any more. I hope Seb or I can get to it in the next two weeks. This seems to work for me and Sebastien with the new gvfs in hardy-proposed. Can everyone who is affected by this please enable proposed updates in System -> Administration -> Software Sources -> Updates, upgrade to the new GNOME releases (in particular, new gvfs and nautilus) and check whether it works now for you, too? /usr/share/applications/defaults.list refers to the wrong f-spot desktop file, it needs to point to the importer. - the double entry of F-spot (one working, one being broken) in the nautilus media preferences. Not a bug in nautilus after all. Works for me. After the update I just have one "f-spot" in the nautilus media prefs. I get the f-spot importer when plugging in a mass-storage camera, and the "open f-spot" button works correctly in nautilus, too. I don't see the problem with importing from a media card fixed by this update. It doesn't look like the updated .desktop file got recognised since I still see 2 items labeled other "F-Spot Photo Manager" item in the Nautilus media preferences. Do I need to restart Nautilus (or logout/login)? If I select the other "F-Spot Photo Manager" item as Michael Ellerman suggests above, then things work as expected. did you try using a new user? it's possible that your user configuration has extra desktop entries in its configuration. why using the f-spot-import command would not be right? I haven't tried with a new user yet. Something is deciding to import the photos from the card instead of the directory I've selected in Nautilus. f-spot-import was my 1st guess since it contains some logic that tries to figure out where to import from. Sorry I haven't had time to debug this further. Will try to make time on the weekend. Nearly fixed for me now -- nearly because there's missing option for import by gthumb in nautilus configuration although I've got gthumb installed. Import now works fine when a media card is inserted. This is on a fresh install of Hardy. Right-clicking on a folder in Nautilus and selecting "F-spot Photo Manager" still causes an attempt to import from a camera or media card. This seems wrong. 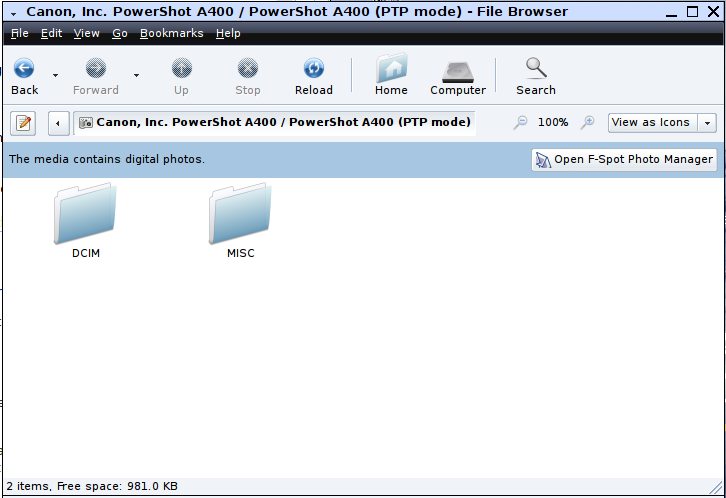 However, it is easy to work around by selecting "Import" from the toolbar in F-spot and then finding the relevant folder. Martin, thanks for testing. The "gthumb does not appear in the dropdown list" is a problem in gthumb, though. Please feel free to report a bug against it. I have just experienced this problem in a dist-upgrade from Hardy to Intrepid. Received error "could not lock the device" while connecting to camera. This has been fixed in the latest Intrepid packages last week.